Dr. Edward W. Younkins is a Professor of Accountancy and Business Administration at Wheeling Jesuit University in West Virginia. 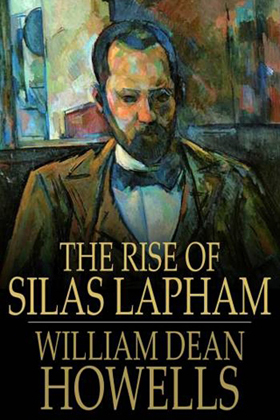 William Dean Howells’s The Rise of Silas Lapham (1885) was the first important realistic novel to focus on an American businessman. The author intended his highly regarded novel to provide moral education to readers. Early in the novel Howells presents an essential business-related moral dilemma that has repercussions throughout the entire story. The main story depicts a man’s moral rise while his prosperity is declining. Silas Lapham is a man from a humble background who has become rich through hard work. The story is set in a time period when many old fortunes were diminishing and when the newly rich were frequently wealthier than the old rich. Silas is a nouveaux riche, post-civil war millionaire who, along with his family, attempts to become part of Boston society. He is determined to place his wife and daughter among that city’s aristocracy. The novel’s secondary but interrelated plot chronicles his family’s awkward attempts to gain acceptance into cultured society. The book begins with reporter Bartley Hubbard interviewing Silas for an article on the businessmen of Boston. The self-assured Lapham is being profiled in this feature article and dictates his biography to the newspaper interviewer. When the upper class Hubbard returns home, he ridicules Lapham for his crudeness, lack of breeding, and simple upbringing. Hubbard’s wife asks him not to make fun of the uncultured and inarticulate Lapham in the piece he is writing. Through this interview, the reader learns a great deal about Lapham’s past. Silas had been a poor child with a solid Christian background. He was raised on a family farm in rural northern Vermont near the Canadian border. His mother taught him the virtues of the Old Testament and Poor Richard’s Almanac. In 1835 Silas’s father, Nehemiah, discovered a mineral paint deposit. Nehemiah experimented with the paint and thought it had the potential to be profitable but unfortunately, at that time, people could not afford to paint their houses. Silas travelled to the West as a young man, but returned to Vermont. He first worked in a sawmill and then as a stableman at a hotel. After his parents died, Silas moved to Lumberville where he drove a stage, bought and managed the stage line, and met and married the village schoolteacher, Persis. Silas married his ideal woman. Throughout the novel, he displays respect and high regard for all the women in his life: his mother, his wife, and later his intelligent daughter, Penelope, and his beautiful daughter, Irene. He is proud of them all. Silas was confident that his wife could handle any situation. She encouraged, helped, and guided him in his various endeavors. Persis also acts as Silas’s moral conscience throughout most of the novel. Her opinions carry great weight with him. His actions are greatly influenced by what he believes will please his wife. But the value of her contributions and her moral assessments diminishes as the story progresses. When Silas left to fight in the Civil War, she managed the paint business for him. During the war, he fights gallantly, is wounded at Gettysburg, and is promoted to the rank of full colonel. Silas’s friend, Jim Millen, died saving his life in the war. Millen took a bullet that was intended for Lapham. As a result, Silas felt an obligation to Millen’s wife (Molly) and daughter (Zerilla). Later in the novel, we see Silas risk his reputation by supporting the dubious, alcoholic widow and daughter of the man who saved his life in combat. Rumor regarding Silas and two women led Persis to misread Silas’s relationship with Zerilla, his typist. Silas’s business suffered during the war. When he returned from the Civil War in 1865, he found a changed business world characterized by rapidly changing dynamic markets, large firms, international trade, and strong competition. After the Civil War, there were more interconnections with suppliers and customers because of railroads, steamships, canals, etc., and distant and local events were affecting one another. He wanted to expand his business, but was reluctant to take on a partner—he wanted to keep the business to himself. Persis convinces him to acquire a partner with capital to expand and to secure the company from failure. Against his own better judgment, Silas takes on Milton K. Rogers as a partner because he thinks his wife always knows best. Silas saw Rogers as unknowledgeable about the paint business and as never having added value to the firm. His intuition was that Rogers would seriously harm the business if he remained with the company. After benefiting from the use of his partner’s capital, Silas gave Rogers the chance of either buying Silas out or selling out to Silas. Rogers was unable to buy Silas out so Silas bought out Rogers, paying him more then he originally invested. After Rogers left the business, Lapham became a millionaire during the post-Civil War period. Persis believes that her husband used Rogers’s capital to get rich and accuses him of unloading Rogers just before the price of paint soared. She thinks that Silas mistreated Rogers and never lets him forget that she is disappointed regarding his treatment of his former partner. She never truly forgives him for being unfair in crowding Roger out of the business. Persis believes that her husband had stolen the future profits that Rogers’s investments had made possible. Throughout the novel she endeavors to make Silas see his “moral failure” and to pay back Rogers in some way. Persis thinks that Silas ruined Rogers’s life through this transaction. In no way is it self-evident that Lapham was unfair to Rogers—at most we could argue for an ambivalent interpretation with respect to his behavior. The business prospered but the partnership did not succeed. Rogers had an option and received a good deal more than he had invested. Lapham contends that he did nothing wrong in buying Rogers out just before the business took off. He says that it was a prudent business decision. Silas thought that Rogers was a hindrance and that he paid a fair price. Persis tries to make Silas feel guilty but it is uncertain as to whether or not there was any moral wrong to feel guilty about. Lapham relocates his paint manufacturing company to Boston while maintaining the mining portion of the business on the family farm near Lumberville. Once his business is a success, the Laphams buy a house in Nankeen Square in the South End and their daughters, Penelope and Irene, attend public school. Penelope, the eldest daughter, is smart and witty, plain in appearance, likes to read and attend church lectures, and has no interest in high society. The beautiful Irene is three years younger, loves to shop, also (at first) has no interest in society, and is not as smart or witty as her sister. As the story progresses, the Laphams become social climbers. Irene and her mother vacation on the St. Lawrence where they meet Anna Corey and her two daughters. Anna becomes ill and Persis cares for her until the doctor arrives. Anna’s son, Tom, joins his family on vacation and appears to be captivated by Irene. On her return home, Persis tells Silas that she was impressed with the aristocratic Corey family. The chance meeting with the Coreys leads to a reevaluation of the Lapham’s lifestyle, and Persis becomes conscious of the difference between her family and members of Boston’s upper class society. The barely educated, uncultured Silas has no personal interest in culture and society but loves his wife and daughters, wants them to be happy, and encourages them to approach society. The Coreys are a prestigious, traditional, old money family who initially associate with the Laphams because of Persis’s kindness to Anna on the Canadian trip. Anna’s husband, Bromfield, is a snob who does not work and who has never worked a day in his life. He inherited wealth from his father, Giles Corey, a merchant who imported goods from India to New England. Anna had never been in the Laphams’ undesirable part of town. She is afraid that her son might marry one of the Lapham girls. Both Bromfield and Anna do not hold high opinions with respect to commercial people. The Coreys’ fortune had dwindled and the Laphams were actually in much better financial standing than the Coreys. Rather than enter the business world, Bromfield sells a house and cuts back on some of his family’s social activities. Although the Lapham girls were uneasy in society, Persis and Silas thought that their daughters needed to be introduced to society and that it would be best for them to move from their old house in South End and to build a new house in the Back Bay area on the sophisticated and exclusive Beacon Street. They decided to build a mansion on the water side of Beacon Street. To Persis and Silas, this new house represented Penelope and Irene’s futures in upper class society. They thought that moving to an elite neighborhood would place the family in the center of society. They did not realize that it would take more than money to break social barriers. For example, the resentful Mrs. Corey remarked that Back Bay is becoming very common these days. Silas’s old partner, the unscrupulous Rogers, shows up and asks for help. Silas lends money to Rogers and accepts as collateral land (i.e., a deed to mill property out West) and questionable securities that he believes to be worthless. Rogers indeed has pledged worthless land and watered stock as collateral. Overlooking the risks, Lapham makes this and additional loans to Rogers throughout the rest of the story. It is unclear if Silas makes these loans out of a true sense of guilt and wrongdoing, or to gain approval from his wife. Although Silas listened to his wife to lend Rogers money, it is not evident that down deep he believed that he had done anything wrong. Persis views the income earned after Rogers was “forced out” to be a result of Rogers’s capital investment. She believes that money was taken from him, and she attributes all of Rogers’s subsequent financial failures to her husband’s actions. Persis thinks that Silas lends money to Rogers as an attempt to ease his guilty conscience due to his forcing Rogers out. As a result, she begins to forgive Silas and to view him as a moral person again. Over the years, she has scolded her husband for his inability to share his paint company with anyone. On the other hand, Silas consistently maintains that his buyout of Roger was a business transaction in which he acted justly. He explains that Rogers did not contribute to the business and was not a benefit to it. It may be that he got involved with Rogers a second time because he wanted to please his wife, who attempts to serve as his moral conscience throughout the novel. The Coreys and the Laphams continue to get involved socially. Both Irene and Penelope are attracted to Tom Corey. Because the Coreys are running low on money, Tom does not want to continue drawing upon his father’s wealth, and therefore tells his father that he is going to ask Silas for a job. Tom’s parents think that his desire to work for Lapham might be because of his attraction to Irene. The Coreys think that it is wrong for Tom to be interested in the uninteresting, dull, and socially-inept Irene. Anna does not want Tom to work for Lapham or to marry one of his daughters. She perceives Irene as vapid and Penelope as introverted. Silas, who does not waste time and is devoted to hard work, criticizes Tom Corey for not working. However, the uneducated Silas is impressed with Tom’s knowledge of several languages. Tom had travelled extensively abroad and was fluent in several languages. Tom believes in the paint business and asks Silas about his entering the business. Tom wants to enter a profession that he can be passionate about. He wants to do something with his life. "Early in the novel Howells presents an essential business-related moral dilemma that has repercussions throughout the entire story. The main story depicts a man’s moral rise while his prosperity is declining." Tom asks Lapham if he would permit him to invest in the paint company and to open branches outside the United States, starting with Mexico. There were emerging opportunities to export mineral paint to Spain, France, Germany, Italy, and other countries. Silas does not want a partner but he agrees to take Tom on as an employee. The young Corey agrees to work for Silas and says the fact that he has gone to college won’t hurt him. Silas is flattered when the young man from one of Boston’s leading families asks him for a job. Tom offers to work for Silas on a commission only basis. He tells Lapham that given his knowledge of foreign languages, he will be able to promote the paint products in a number of different countries. Silas gives Tom a few months to learn the business, lets him do office work and translate foreign correspondence, and appoints him to be head of foreign paint sales. The newly rich Silas spends money on charities and church but not on social activities. He does not learn to spend his wealth in the manner that accepted families of society do. His language is not acceptable and he is somewhat boastful and obnoxious. Silas flaunts his wealth and he is unfamiliar with social conventions. Lacking manners, culture, and the social graces, he is shunned socially and deemed to be socially inadequate. For much of the story, he does not understand how his own prosperity and crudeness could be inconsistent with culture, education, and so on. Despite his deficiencies, Silas comes off in the novel as generally smart, likeable, powerful, and just. The Coreys invite the Laphams to attend a dinner party at their tastefully decorated house. Penelope decides not to attend the event because she feels uneasy around Anna Corey and because she thinks her father might boast too much. In fact, Silas, who is fearful of making social errors, drinks too much wine and talks too much. As the evening wears on, he becomes louder and more boastful. Silas attempts to apologize to Tom at work the next day. Tom brushes the apology aside and says that Silas’s intoxication was the fault of Tom’s family, who knew that Silas did not drink. After the dinner party incident, Lapham realizes that his pride and ambition had overreached himself. At the dinner he was challenged to understand that his habits, demeanor, education, and manners were inadequate. After the dinner party, Silas becomes honest with his genuine self-identity and self-interest. He sets aside the notion of social propriety for himself in favor of his honest and self-reliant personal pursuit of his own objective values. Of course, he continues to support his daughters in their own efforts to join the social elite. Tom Corey expresses his love for Penelope rather than for Irene. No one had suspected that Penelope was the sister that he was in love with. Tom desired a smart and witty woman with depth and a good personality. Penelope also had feelings for Tom but she feared that Irene would be devastated if she and Tom began a romantic relationship. Penelope is pleasantly surprised when she learns about Tom’s love for her, but she is hesitant and does not want to betray Irene who loved Tom first. Penelope informs her parents about Tom. They speak about the situation to Reverend Sewell, who observes that Penelope and Tom would be doing no wrong. He explains that keeping Penelope and Tom apart would only bring unhappiness to all concerned. Sewell’s analysis was based on what he termed the “economy of pain,” which stated that pain should be limited to the fewest number of individuals possible. Sewell says that Penelope and Tom should pursue their love. In that case, only one person would be hurt. On the other hand, if Penelope gives Tom up, then all individuals involved would be hurt. As expected, Irene takes the news hard, but she tells Penelope that what happened was not Penelope’s fault. After learning of the situation Irene departs to live for a while in the Lapham’s Vermont home. Penelope initially refuses Tom’s proposal of marriage. This decision reflects the mistaken ideal of self-sacrifice. All the while, Rogers has repeatedly been coming to Lapham to borrow more money to invest in his speculative, unsuccessful, and sometimes scandalous dealings. Silas continues to rely on Persis’s sentimental and mistaken judgments and lends Rogers more and more money. Silas’s paint business begins to deteriorate as the economy slumps, competition increases, and his paint sales drop. He encounters a keen competitor with respect to paint production from a West Virginia firm that can produce paint less expensively because the company owns natural gas wells, which bring down its fuel costs. The West Virginia firm has natural advantages that Silas cannot compete with. The discovery of natural gas by the West Virginia company alters the relative cost structure between the two companies. Lapham has also been supporting the family of Jim Millen, who saved Silas’s life during the Civil War. He gives money to the wife, Molly, and hires the daughter, Zerilla, to work as a typist in his office. Persis advises Silas’s not to give the Millens any more assistance because she believes that Silas has already done enough to meet his obligation to them. This is the opposite of the opinion she has with regard to Silas’s debt to Rogers. The cost of the home Silas is building has skyrocketed to more than $100,000. Silas considers filing for bankruptcy or selling the house in order to escape financial ruin. The young Corey offers Silas money, but Silas declines and decides to sell his house instead. Silas receives an offer to buy the lavish new house that he is building. He goes to see the house one more time, makes a fire in the chimney, and decides not to take the offer. He fails to completely extinguish the fire, which ultimately destroys the house. At first Persis is afraid that Silas will be charged with insurance fraud, but that does not come to pass because the insurance policy had expired a week earlier. Lapham has loaned money to Rogers and has accepted as collateral a number of mills in the West that he knows to be of very low value. Needing money, it appears that Silas will have to sell out to a railroad company at a very low price because of his inability to negotiate with the company. The property on which his mills are located is served by a spur line of a railroad company that wants to purchase the property at a bargain price. The owner of the railroad realizes that the company can decrease the property’s value to whatever price it desires to pay by restricting services to the land in question. The railroad company wants to buy the mills and the mills are dependent on the railroad. Rogers brings to Silas dishonest men who want to buy the land for unsuspecting clients from England. Rogers shows up with an offer from some Englishmen who desire to buy the mills for a great deal of money. Lapham assumes that the people with whom Rogers is dealing do not realize the worthlessness of the land. Lapham has to decide whether to sell the land to these supposedly unaware people, or to refuse to sell, thereby saving the other party from losing money due to Rogers’s scheme. In fact, the Englishmen are Rogers’s accomplices who were to be paid out of Rogers’s share of the purchase money. These individuals are agents for a philanthropic charitable group in England that wants to establish a utopian community on the mill property. These agents know that the mill property is worthless—they simply want to garner high commissions for their work. Silas does not want to be a part of the swindle of Rogers’s prospective buyers. He goes to these Englishmen to expose Rogers, but they say they are already aware of the land’s value. They tell Silas that the loss will be borne by wealthy men in England for whom they are working. They assure Silas that their principals are aware of the potential risks and that they are ready to assume them. For a short period, Lapham is ambivalent and undecided about doing business with the agents of the British philanthropic society. If he sells to the agents, both they and Rogers will make money and his paint business will survive. The loser would be the English gentlemen from the utopian charitable group. Silas realizes that he would be cheating them. Silas makes the just and moral choice by refusing to sell the Western mill property to the agents of the charitable organization. When Lapham decides that it is wrong for him to sell to these men, Rogers offers an alternative. He suggests that Lapham sell to him and he would then, in turn, sell to the agents. His presumption is that such a tactic would absolve Silas of any personal moral responsibility. Of course, Silas declines to accept Rogers’s offer. Silas makes these moral judgments himself without the guidance of his wife. He decides not to sell, thus accelerating his impending bankruptcy. He ends up accepting a low offer from the railroad. The morally righteous Lapham is unwilling to stoop to deceit to save his paint business. As a free moral agent, Laphan controls the probability of his own bankruptcy. Facing bankruptcy, Lapham attempts to forge a merger with his West Virginia competitor. In order to go forward with the merger, he needs to obtain capital from another investor. Shortly after Silas refuses to sell to the English agents, a potential New York investor offers the needed substantial new capital in order to join Lapham’s firm. Facing another opportunity to act honestly and justly, Silas resists the chance to misrepresent his failing company to this interested investor. He completely and objectively discloses all of the relevant financial details of his company and makes it known that he intends to use the investor’s cash to effect a merger with his West Virginia company thereby avoiding bankruptcy. The potential investor withdraws his offer as a result. Lapham files for bankruptcy and turns his Boston home, business, and other assets over to his creditors. After liquidating his assets, he leaves Boston as an honest man who has self-respect, self-esteem, and self-knowledge. Silas and his family return to his homestead in Vermont where he continues to manufacture his Persis line of paint but on a smaller scale. Silas arranges for Tom Corey to obtain a position with the West Virginia paint company, where he becomes part owner. The young Corey goes to Vermont to ask Penelope to marry him before he leaves for South America to be a salesman for the West Virginia company. Penelope ultimately decides to marry Tom. Although the younger Laphams do join the social elite, back in Vermont, Silas and Persis no longer are concerned with culture and social etiquette. They have happily returned to a peaceful and quiet country life where social position does not matter. Silas is not broken. He knows that he is an honest, moral, and independent man who made something of himself through hard work. He is honest, both with others and with himself, and possesses underlying dignity and decency. He knows that his business and personal decisions were made based on justice and fairness rather than on emotion and sentiment.